NOW AVAILABLE: Heavy-duty, high-power, long range, and versatile. A 24-Speed Superbike that will thrill you on the streets, take you to the boonies, and tackle the trails. With its 500 Watt (900 Peak) High Torque (90 Newton Meters! )* German Das-Kit motor capable of pedal assist speeds of 28 MPH (20 mph throttle), and huge 48 Volt 13 amp (624 Watt/Hours!) LiNMC battery, you'll have power and range to spare. Electric power is supplied through six speeds of cadence-sensing pedal assist PLUS a Trigger Throttle brightly displayed on its Multifunction LCD display. The beautiful and beefy hard-tail frame sports a Suntour 100 mm lockout hydraulic fork and is outfitted with quality components including Tektro Auriga Hydraulic disc brakes, Shimano cranks, and Altus and Acera derailleurs. 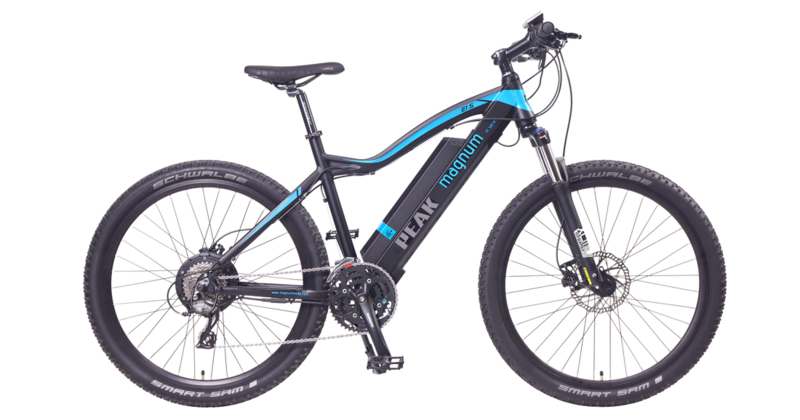 And the Peak is connected to the road through all conditions by premium SCHWALBE SMART SAM 27.5 X 2.25 Kevlar-lined all-terrain tires. Put it all together and you have one great 'Go Anywhere' Machine! ​Get 2 for the price of a Haibike and all the benefits of a Throttle ! *A Newton Meter is a Metric (SI) unit of torque (tendency of a force to cause rotation), used also as a unit of energy.